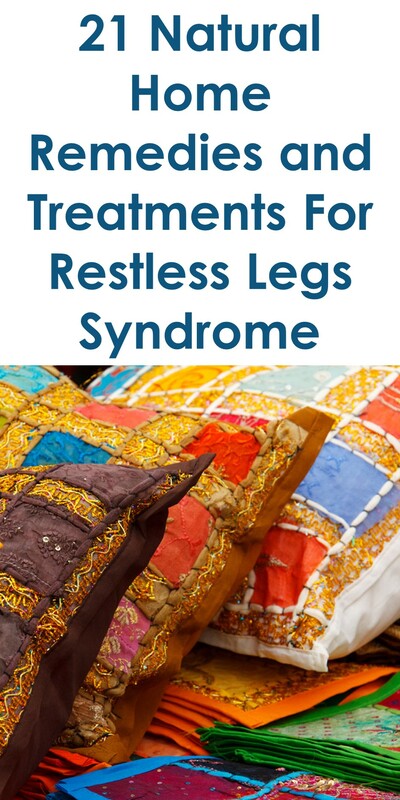 Restless Legs Syndrome is a poorly understood neurological disorder that triggers a burning, crawling, tingling, and painful sensation in the legs at night create an urge to move them. The exact cause of RLS is unknown. However, RLS has been associated with diabetes, obesity, pregnancy, nerve disease, iron deficiency, hypertension, kidney failure, and heart disorders. There is no cure for RLS. However, the symptoms can be managed. 1. Vitamins And Minerals: Take Vitamin And Mineral Supplements. 2. Iron: Consume Foods Rich In Iron. There Is Positive Link Between Anemia And RLS. 3. Medication Journal: Monitor Your Response To Medications. Some Medications Such As Allergy Pills Contain Stimulants That Can Trigger Jittery Legs. 4. Stretch Exercise: Stretch Your Legs. 5. Pillows: Sleep With Pillow Between Your Legs. 6. Room Temperature: Change Your Room Temperature. Sometimes A Switch From Hot To Cold Environments Or Vice Versa Can Do The Trick. 7. Diet: Maintain A Healthy Diet. 8. Strolls: Walk And Take Evening Strolls. 9. Magnesium: Consume Foods Rich In Magnesium. Magnesium Deficiency Can Contribute To Muscle Jittering And Twitching. 10. Socks: Wear Socks To Bed. Some Experts Have Seen Positive Relieve From RLS From People Wearing Socks. 12. Chamomile: Drink Chamomile Tea To Reduce RLS Effects On Your Body. 13. Probiotics: Eat Probiotic Foods Such As Yogurt And Kefir. 14. Swimming: Include Swimming In Your Weekly Routine. 15. Exercise: Exercise Regularly. Sedentary Pose And Lifestyle Tend To Increase Risk Of RLS. 16. Meditate: Chronic Stress Increase Risk Of RLS. Meditation Would Help Reduce Stress. 17. Constant Bedtime: Choose A Relatively Constant Bedtime To Tune Your Brain To That Time. 18. Drop Bad Habits: Avoid Cigarette Smoking And Alcohol Consumption. 19. Hot And Cold Compresses: Have Hot And Cold Compresses. This Helps To Relax The Muscles And Reduce Symptoms Of RLS. 21. Massages: Have Leg Massages.